Last summer, the Penn Museum’s 3,300-year-old Sphinx, the iconic statue that has presided over its Egyptian galleries, witnessed something unprecedented: the deinstallation and removal of much of the Museum’s acclaimed Egyptian collection. The move paved the way for extensive renovations to the Museum’s galleries and public spaces. 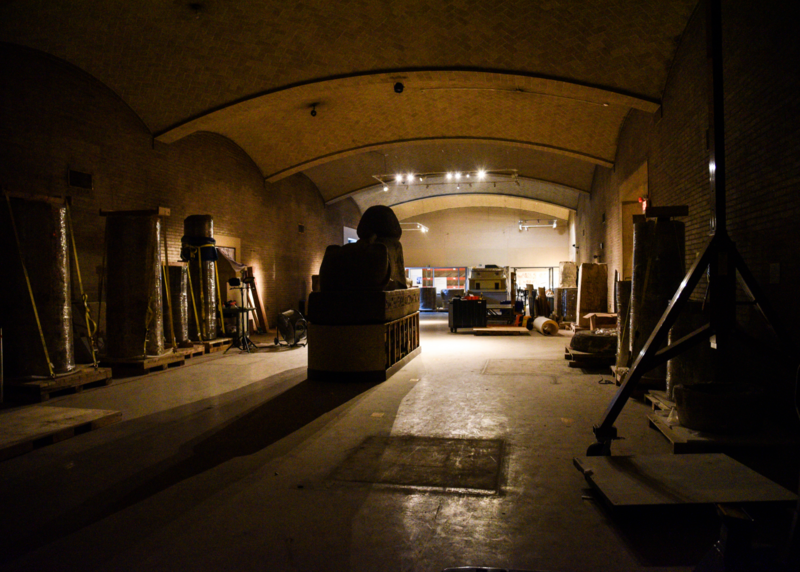 The red granite Sphinx of Ramesses II watches over the gallery as artifacts are packed in preparation for conservation. Photo by Raffi Berberian. “This is a monumental effort in every sense of the word,” says Head Conservator Lynn Grant of the Museum’s plans to remake its Ancient Egypt and Nubia Galleries and the behind-the-scenes work the transformation entails. To date, close to 80 percent of the Museum’s 48,780 ancient Egyptian artifacts have been removed from its exhibits and storage rooms, packed, and transported to a custom-fitted off-site warehouse. Only the Sphinx and other immovables remain. Within the sprawling warehouse, curators and conservators—as well as architects, structural engineers, riggers, and scaffolders—are working together to conserve and re-engineer objects as massive as the Museum’s famed palace of the pharaoh Merenptah and as small as an iPad-sized stone relief. Many will be part of newly developed exhibits when Museum renovations are complete. One of the most stunning relics is a 4,000-year-old tomb chapel that belonged to a high-ranking Egyptian official named Kaipure. Called “one of the treasures of our collection” by David Silverman, the Eckley Brinton Coxe, Jr., Professor of Egyptology and Curator-in-Charge of the Museum’s Egyptian Section, the chapel will be featured in the revamped Egypt and Nubia Galleries. Work is currently focused on one of its walls. 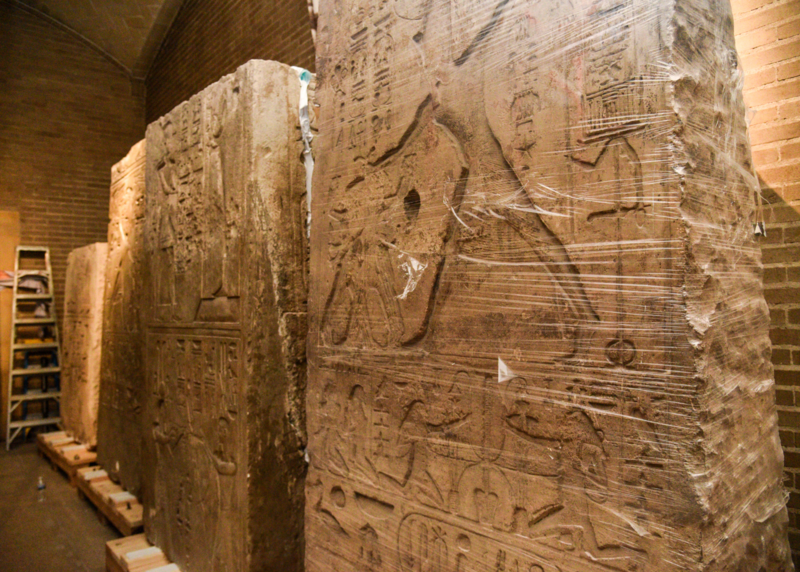 Monumental elements from the palace of Merenptah were carefully wrapped by conservators. They will be reinstalled at full height for the first time in the upper floor of the Coxe (Egypt) Wing. Photo by Raffi Berberian. Made up of 75 elaborately carved and painted limestone blocks, the wall includes depictions of life in ancient Egypt and preparations for the afterlife. The intricately decorated piece went on display soon after the Museum’s Egyptian wing opened in 1926, and it remained in place for close to 70 years, when the Museum removed and conserved half of it for a traveling exhibit. On its return in 2000, the conserved half was put into storage. When preparations for the building renovations began in 2015, the tomb chapel was one of the first pieces to which the Museum turned its attention. Like many of the Museum’s monumental objects, the tomb chapel confronted staff not only with significant weight, size, and physical deterioration, but also the puzzle of how to take it apart—a task made especially difficult given the lack of records documenting its installation. 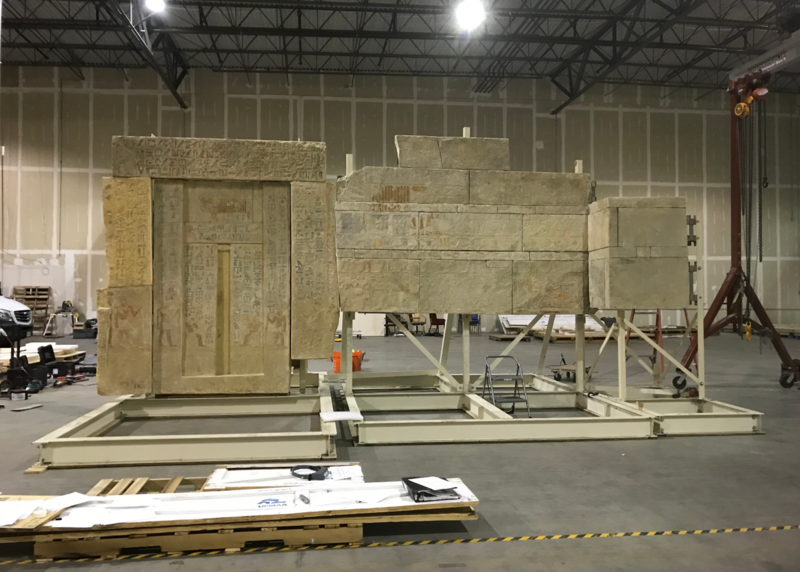 After careful analysis, conservators removed each of the wall’s limestone blocks from its 1920s-era framework of wood and metal pins, assessed their condition, treated them as necessary, and packed each for the move. This summer, they were transported to the warehouse in a specialized fine arts truck. A section of the tomb chapel is assembled in the Conservation Lab Annex, where conservators and rigging specialists are devising a new support structure. There, staff have been conserving and reassembling the pieces. Already, the section that was in storage has been reconstructed with the help of riggers who lifted segments into place and engineers who designed a new frame and supports. A similar process awaits the other sections and walls. Once the chapel is rebuilt, the team will disassemble it, then pack up the blocks and return them to the Museum’s renovated gallery to be installed for what they hope will be decades to come. In its new home, the tomb chapel will be the focal point of an exhibit that invites visitors to stand within its walls and experience the vibrant and layered world of ancient Egypt. 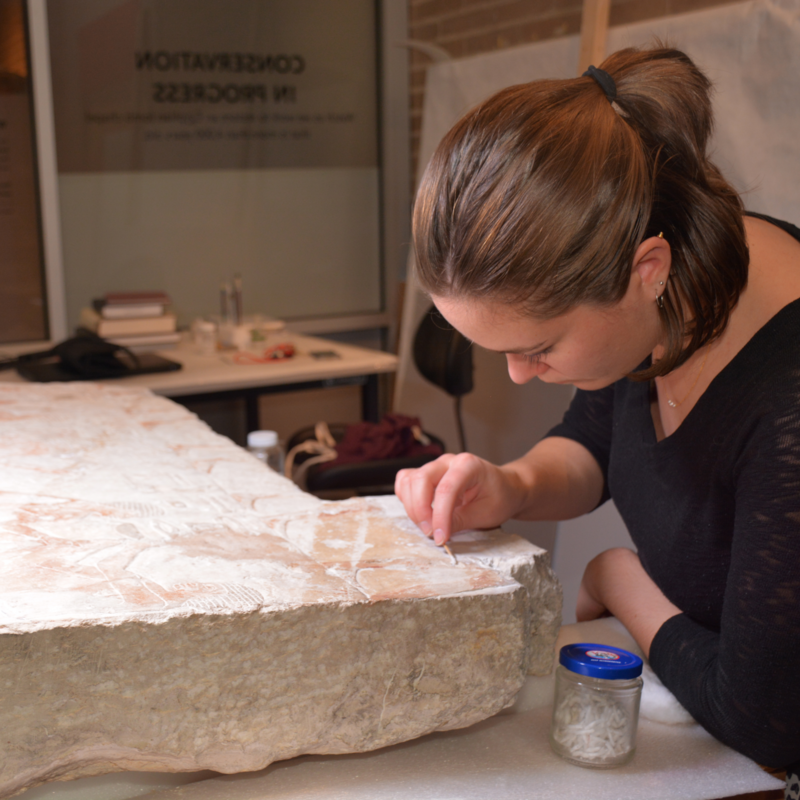 Alice and Herbert Sachs Egyptian Collections Conservator Anna O’Neill cleans the limestone blocks of the tomb chapel, which will be assembled in a new support structure for display in the Ancient Egypt and Nubia Galleries. For Project Manager Bob Thurlow, who is coordinating the logistics of the move and conservation process, the details loom large, but the big picture is never far from view. “All of the work we are doing will enable the Museum to tell the story of ancient Egypt in a much more powerful way,” he says. That work is expected to wrap up in 2022, the targeted opening date for the Ancient Egypt and Nubia Galleries. For now, the museum long-known for the quality of its ancient Egyptian collections is gaining attention for its success in moving them: last month, the Museum of Fine Arts in Boston, about to begin the deinstallation of their ancient Egyptian collections, called to discuss how it’s done. Visit the Penn Museum’s Campaign site to learn more about the Building Transformation campaign and how you can help move it forward.